Quick overview A must-have for children, parents and teachers preparing for the grammar, punctuation and spelling test at the end of KS1. With help from friendly bird characters, grammar is explained, punctuation is clear and spelling tips are revealed. Includes a dictionary of the curriculum words children need to know and fun ways to remember how to spell them. 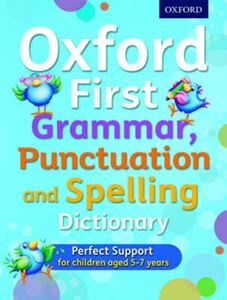 Colourful and fun-to-use, this first reference book divides into three sections: grammar, punctuation, and spelling. In the first section, there are simple meanings, with friendly examples and interactive questions, for all the grammar terms required by the curriculum. Then it gives the punctuation marks and shows how to use them and finally provides rules and tips to support first spelling. At the back is an alphabetical dictionary of the curriculum words that children need to know, including tricky words, and fun ways to remember how to spell them. A cast of colourful, friendly birds give parents and teachers questions and tips to clarify understanding. The dictionary is accessible and age-appropriate. A valuable resource for preparation for all levels for the KS1 Test. Online spelling lists, punctuation, and grammar activities will be provided for easy practice at home or as part of lesson starters or as homework.